My old apartment in New York City had seen better days. Stains had darkened the carpet by several shades, and gusts of wind would blow crumbs of decaying brick from the walls. But those details were easily overshadowed by the glaring health code violation that was the bathroom. The ceiling had sprung a leak directly over the toilet. Whenever the upstairs neighbors took a shower, dirty water came down in a robust pitter-patter; other times a light drizzle descended. Nature calls whenever she chooses, however, and one day I needed relief during a bathroom downpour. So I threw on my rain slicker, opened my umbrella and charged in. After that day—and until the ceiling was fixed—I kept an umbrella hanging on the towel rack. My modest innovation, spawned by desperation, does not come close to the blazing insight that led to the creation of Amazon, the iPhone or wrinkle-free pants. Yet psychologist Evangelia G. Chrysikou tells us we can find inspiration by dropping our internal filters and rethinking the uses of everyday objects. 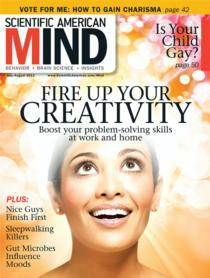 Turn to “Your Creative Brain at Work,” on page 24, to garner more tips. Even the grim reaper can hoist us closer to mental magnificence. In “Mortal Thoughts,” on page 54, psychologist Michael W. Wiederman explores how acknowledging our inevitable demise can shift our personal values from material goals to idealistic pursuits, encouraging us to focus on the facets of life that are most rewarding. Abandoning material concerns—such as the desire for a functional bathroom—was a winning strategy for me. In short, I moved. May you also find simple tweaks that allow your mind to soar to creative heights.